Antonio Neri, Tesoro del Mondo, f. 9r. "Arts Preparatio frugu vel Piantar." In a 1598 manuscript devoted to "all of alchemy", Antonio Neri singled out four particular practices, each of which he made the subject of a detailed illustration. Each is devoted to a different "art"; preparing animals, stone/minerals, plants and metals. The manuscript was produced over a period of two years starting when he was just twenty-two years old. He began writing shortly after his ordination as priest and the work was completed before he was employed making glass for the royal Medici family in Florence. Neri is best known for writing the first printed book of glassmaking recipes, so we might expect to find that subject covered in the early manuscript, but nothing appears aside from a single recipe for artificial ruby which makes use of glass. 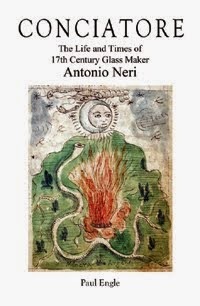 Indeed, the general conclusion of historians is that his involvement in making glass did not start until 1600 or 1601. Absent of any direct citation of that art, the manuscript does show a familiarity with the kind of individual skills required. Among the things Neri would need to know was the ability to make "glass salt" from certain dried plants. Presently we will look into the third of the illustrations mentioned above, which he titled "The Art of Preparing Fruits or Plants." All of the activities depicted here relate to food and drink, yet they could easily be applied toward other purposes. At center-left of the illustration at hand, we see a male farmer holding a flail, perhaps going about the business of threshing wheat, which appears in a bale behind him. 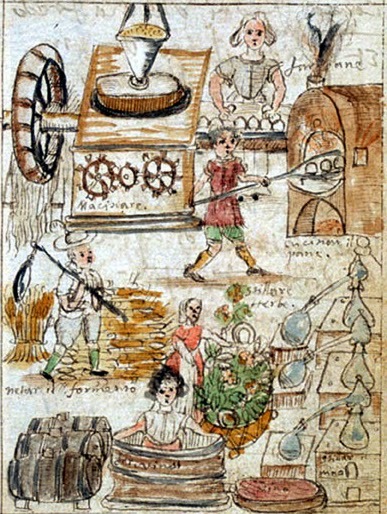 Figuring prominently above the farmer (upper left) is a large mechanical apparatus that appears to be a gristmill powered by a waterwheel. A conical bag feeds grain or possibly corn from above into the central hole of a horizontal grinding stone supported by a large rectangular box. We can easily imagine that the gears shown on the front of the box control the drive or the gap between the stones. Wheat, of course, was an ancient well established staple. Corn was introduced as a direct result of Columbus' voyage to Cuba and by Neri's time, corn was being widely cultivated throughout southern Europe, northern Africa, and even as far as China. Returning to the illustration, on the immediate left of the mill is a woman, who we can guess, is fashioning rolls or small loaves of bread from dough made with flour from the mill. Below her, (center right) is a boy using a long paddle to put the balls of dough into a baking oven. In effect, Neri is showing us the full chain of events from harvesting to finished baked goods. Further down, another woman works over a large basket of herbs, which appear destined for three large glassware stills to her right. In his book, Neri presents numerous recipes for extracting paint pigments from flowers using similar methods. At the bottom of the illustration, a third woman stands in a large wooden tub crushing grapes with her bare feet, as grape juice runs into a pan on the right. To her left are three wine barrels standing side-by-side. For us, the connection to alchemy might seem tenuous with the possible exception of the distilling stations. For Neri, there was a deep lesson here about the way nature works; in his later manuscript Discorso, he uses the growth of grain as a metaphor for "multiplying" the "seeds" of gold inherent in primordial material left over from the creation of the world. Given knowledge of how to work in harmony with nature and bring about the right conditions, he was convinced that a small quantity of material could be converted into a large amount of precious metal. The illustration on the art of preparing plants simply showed a different manifestation of the same principle; he is showing how grain multiplies in the fertile earth, it is then transformed through the addition of water and fire into nourishment. Grazzini 2012, p. 454, (Neri, 1613). * This post first appeared here in a slightly different form on 10 Sept 2014.